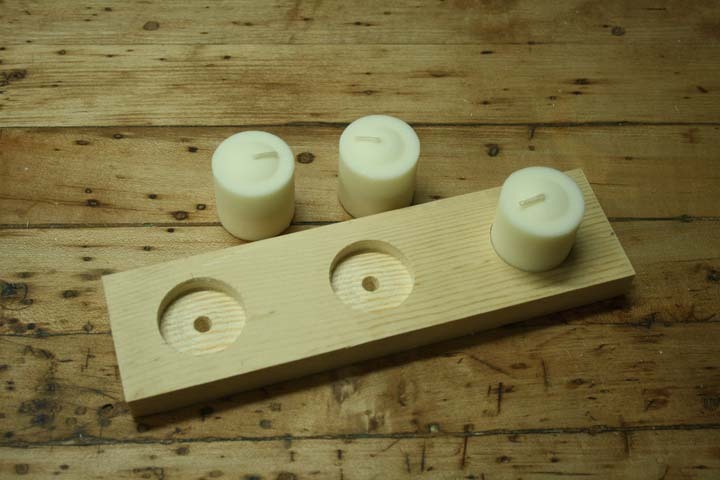 This tutorial will teach you how to make an easy DIY tea light holder. I really like contrast staining, and will be teaching you the same technique on this piece. The candles used in this demonstration are regular short pillar candles, but the holder will take tea lights as well. I like the larger candles, but you can use either with this design. The entire process is done with common shop tools, and substitutions can be made along the way. For example, if you do not have a drill press, a hand drill will work just as well. If you would like different diameter candles, you can make that adjustment too by changing your drill bit size. If you like the diy tea light holder just the way you see it, then all you need to do is follow the instructions. In the end you will have a candle holder that looks just like the one you see in the pictures, and will last a very long time. Be careful around your tools, and I hope you enjoy my DIY Tea Light Holder tutorial. 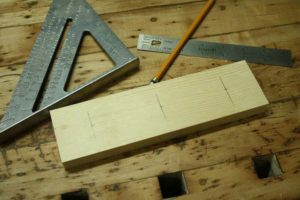 To make this project, you will need a piece of wood that measures 9 inches long and 2-1/2 inches wide. You will also need a 1-1/2 inch diameter paddle or Forstner bit. Select any species that you like for the project, but be aware that different types of wood react differently to the rustication and contrast staining technique. 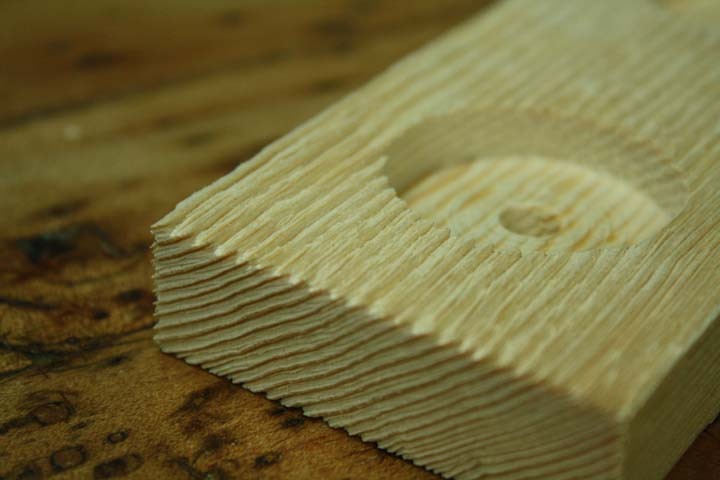 Pine is a great choice, because the difference in density between the grain lines and the flake is high. This means that the wire wheel process that we do later will be much more pronounced. Also, a lighter color of wood will take the contrast stain process much better too. For this type of project, Pine is the best choice. A nine inch board is very convenient for a three inch wide placement of the tea lights. This makes good use of the available space, and it also spreads out the candles nicely. Make three marks across the grain like you see in the picture on the left. The middle mark is in the center of the board, 4-1/2 inches from each side. Then, measure out three inches to the left and the right and make two more marks. Now, find the center of the lines and place three additional marks, one one each line. This will center all of your candles on the board, and they will all be three inches away from each other. Use an awl or pointed screw to make a small indentation at the three intersections. This will help guide the drill. The drilling operation is best done on a drill press, but it can be done by hand as well. A couple precautions before starting out though. Make sure to clamp the piece on the drill press or on the bench if you are doing this by hand. If the drill catches, it will rip the piece from your hands, and can cause injury. 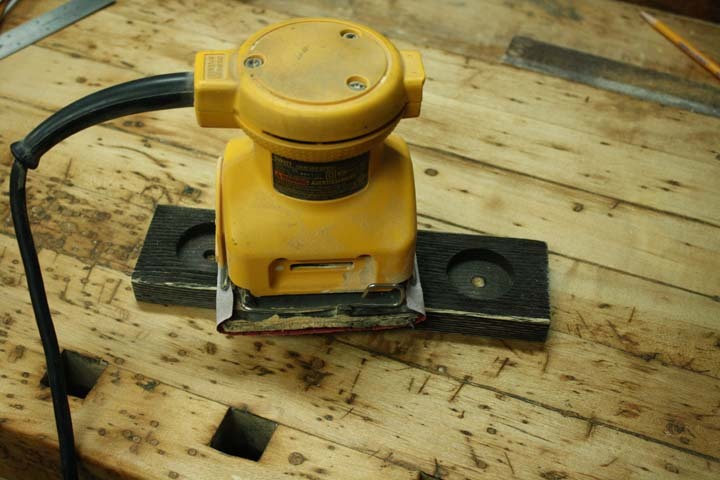 Also, if you are drilling on a bench, make sure to have a scrap board below the piece. The drill will exit the bottom, which is used for removing a stuck candle or tea light. Protect the surface below your tea light holder if you care about it. 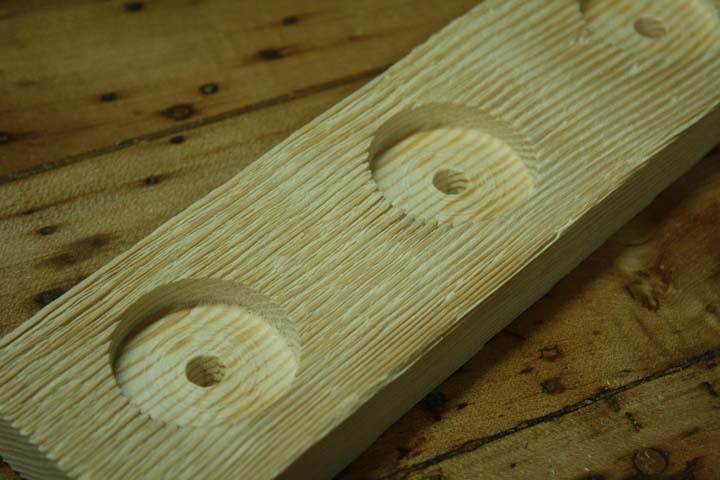 Set the drill press (or mark your bit if drilling by hand) so that the bit only goes into the piece 3/8 of an inch. This will be deep enough for the center guide to pop a hole through the bottom, and a perfect depth to securely hold the tea light. Drill all three locations, stopping at the 3/8 inch depth mark. On a drill press this is very easy, because you can set your stop. Once the drill press will not go down any farther, retract the bit and the hole will be correct. 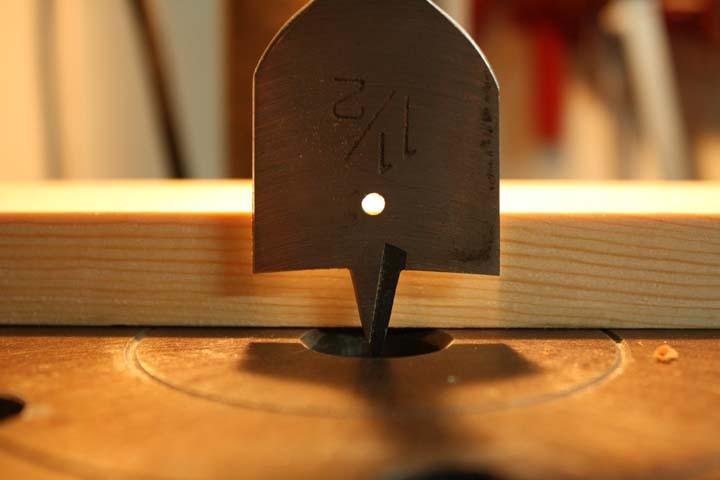 On a hand drill, carefully approach final depth by watching the mark you made on the bit. Once you get close, reduce your pressure a little and sneak up on the measurement. Check the three holes to ensure that they are all even, and you can even test fit the candles at this point if you like. Some people really like the look of natural Pine. If this is you, skip to final sanding, and then add a lacquer coat to seal the wood. If this is not you, keep on reading. Rustication is the process by which you simulate age or distress to a new project. In effect, you make it look old or worn. There are a number of great ways to rusticate this tea light holder, but a wire wheel is one of the best. 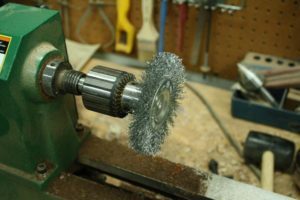 In this demonstration, I am using my lathe to turn the wire wheel. You can use a lathe if you have one, or you can use a drill press or hand drill. These wheels come from hardware stores, and they are meant to be inserted into a chuck of some kind to operate. They come in a number of types, and a middle of the road medium stiffness wheel is the best choice. This is where the fun begins. Carefully touch the candle holder to the wire wheel as it turns. 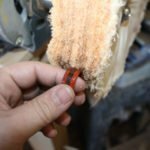 As you do this, the bristles will remove the softer wood from in between the grain lines. This leaves a weathered and eroded effect. Work in the same direction as the grain on all surfaces. Be very careful when working near the wheel, because it can remove skin just as fast as it removes wood. Always let the wheel try and pull the piece from you rather than towards you. It can take a little time to master the technique, but after a practice board or two you should be able to do it. Work the wheel against the wood and keep the piece moving. The more contact with the wheel, the more the wood will be removed. 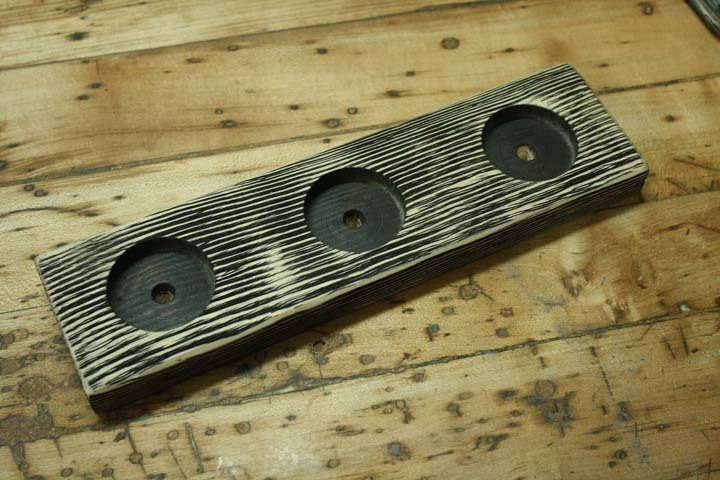 Here is a look at the tea light holder after using the wire wheel. The surface is very rough, and looks like it is very old. Run each surface of the piece against the wheel one at a time. Focus on creating an even look before moving on to the next surface. You can always go back and make it deeper or more weathered looking after you have finished the initial rustication. However, it will take much more effort to make it smoother, so pay attention to how much material you are removing. If you want to make a very deeply weathered piece, go over it slowly until you get very deep grooves on all surfaces of the wood. Do all surfaces but the bottom. Here is a close up view of what my piece looked like after I was done on the wire wheel. I followed the grain lines as I went around with the wheel, and moved the piece slowly throughout the process. You can see that there are very deep grooves cut into the wood, and they pretty much follow the existing grain pattern. If you are looking for something a little less even, you can always hit some areas a little harder or deeper. Naturally aged pieces have different areas on them. Some show more age than others. When you age something artificially, you can get the same effect if you add more pressure to a couple random places. 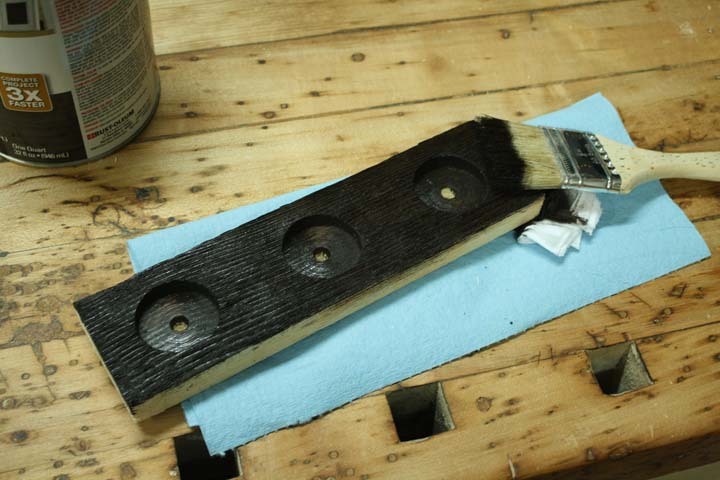 The first part of any contrast stain is to apply a coat of a dark stain to the entire piece. 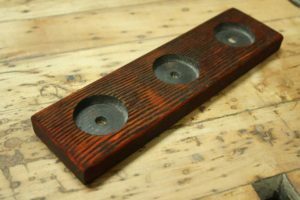 For this diy candle holder, I used Rustoleum Wood Stain, in the Kona color. Kona is a very dark brown color, and it lends itself well to a contrast stain where you want a natural look. Black is the mother of all base colors, but sometimes it’s a little too much for something that needs a little more of a wood look. You can use any dark brown stain that you have in the shop for this process, I am simply showing the product that I actually used. 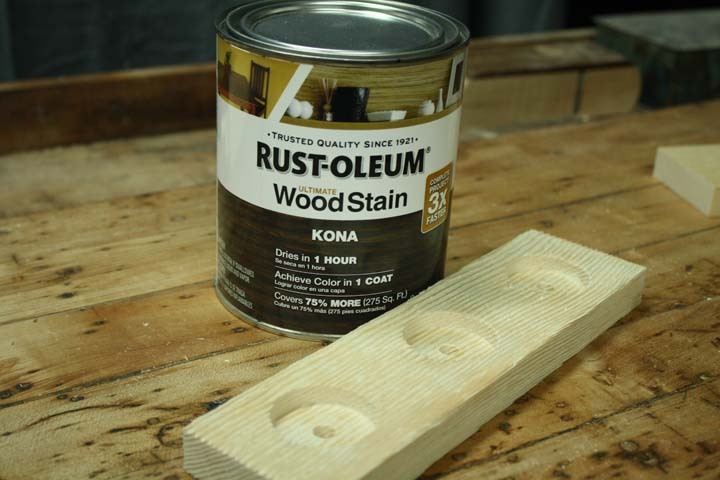 I like these stains from Rustoleum, and they are inexpensive, so I use them quite a bit. First, coat the insides of the tea light holes with a cloth. A brush will work too, but it tends to deposit a ton of stain where only a normal amount is needed. Wear gloves, and dip a small clean cloth into the stain. Then, cram it into the bottom corner of the hole and wipe it around. 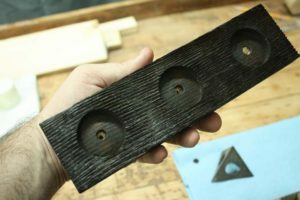 You want to make sure that you coat the entire bottom and sides of the candle holes. After that, use a corner of the cloth to get into the very small hole at the center of the candle area. This will coat that portion too, and keep everything an even shade of brown. I did mine a little later in the process, but it’s easiest to do it right now. 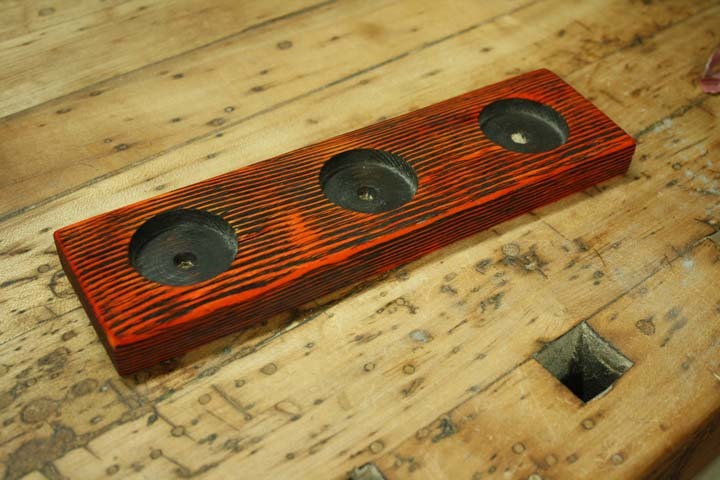 Once you are done getting the holes stained, it is time to move on to the rest of the tea light holder. I am normally not a big fan of applying any kind of finish with a brush. They typically leave too much product behind, and can take forever to dry. However, the rustic nature of this piece requires a brush to get into the tight spaces. Dip a clean bristle brush into your stain, and begin applying it to the piece. Focus on working it down into all the grooves, and then brush away the excess afterwards. The brush will really help get the stain where it needs to go. Work one section at a time, and then move on to another section. Make sure to wear all of your personal protective equipment, and to work in a ventilated area. The photo on the left is of me holding the piece after it has dried to show how well the coverage needs to be. The peaks will be sanded down later in the process, and only the valleys will have dark stain in them. It is very important to have good coverage, and that no white from the wood shows through the final product. 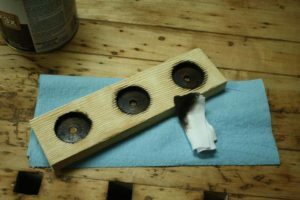 If you still have lighter places on the tea light holder, go back over them again with more stain until they have been darkened to match the rest of the piece. Finally, set up a few painters pyramids (small plastic pyramids that hold pieces up off your table while working) and rest the piece face down. Then, use a cloth or the same brush to stain the bottom to match. Some people do not like to finish the bottoms of their pieces. I personally think that all surfaces of just about every project should be finished. It only takes a few more seconds, and it gives the piece a complete look. Once you have fully stained your homemade candle holder, allow it to dry on the painters pyramids for a couple hours. If you really laid on the stain, you may need to give it overnight to fully dry. The thicker the coats of finish, the longer it takes to dry. Also, if you are in a cold area, or an area with higher humidity, it can take longer too. If you are in doubt, be safe and leave it overnight. Contrast staining involves laying two coats of stain in place. A dark base coat, and a lighter top coat. 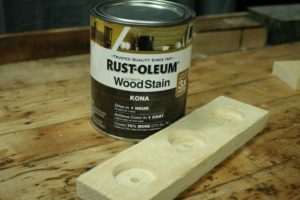 In order to see the lighter top coat, you need to expose some fresh wood for the stain to color. 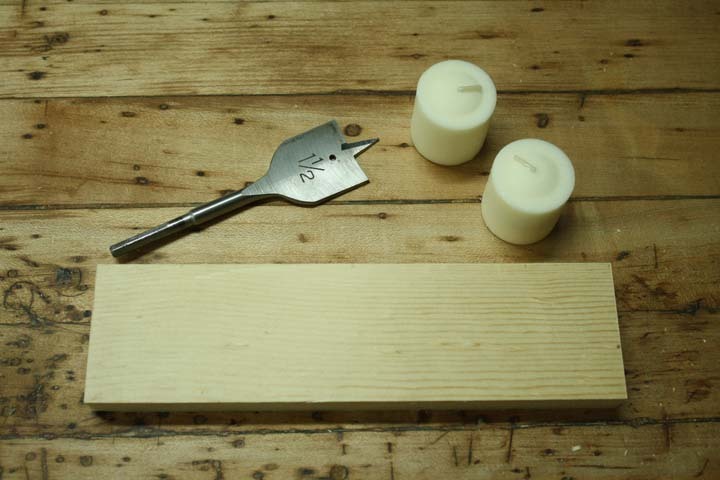 The easiest way to accomplish this on your tea light holder is to use a power sander to knock down the sharp peaks. You can also do this by hand with sandpaper. The advantage to using a power sander is that it will be faster, but a beautiful contrast can be had by hand just the same. The point of this process is to just remove the peaks from the rough surface. It will expose new wood, and you will immediately see a difference in the look. 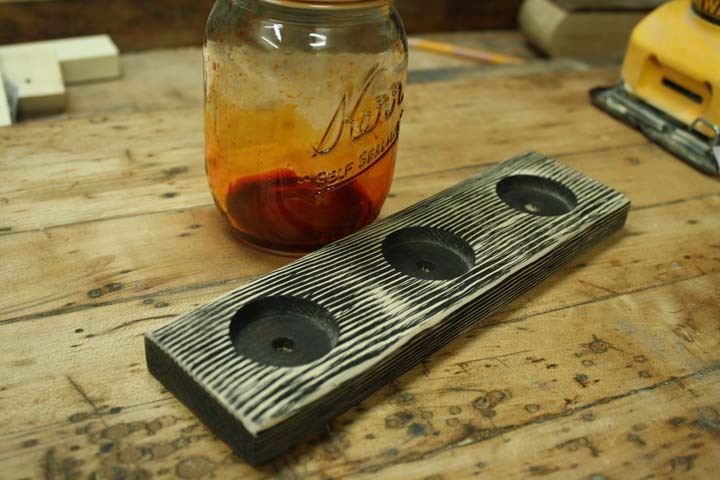 The final look that you want on your homemade tea light holder is really up to you. Depending on how much you sand, you can vary your look quite a bit. If you really want to see the top color more than the background color, sand the piece until you see more fresh wood than dark wood. If you would rather see more of the dark wood than the lighter color, sand the piece lightly until only the very tops of the peaks have been sanded back to fresh wood. The look is completely up to you. Once you are satisfied with your contrast, dust off the piece with a clean brush or use an air chuck to blow it off. This will give you the best look at your work, since sawdust can blur what you are seeing. If you need to address certain areas more, go ahead and deal with them now. Once the top stain is applied, they will be much harder to go back and fix. Also, take a minute to round over the corners and sharp edges. It’s best to do this after you get through the initial sanding, because sometimes they will have been already taken care of as you sanded the piece. Before moving on, remove all the dust again. Next, prepare a lighter color of stain for your contrast. For this example, I used a water color stain that was three parts yellow and one part red. Water colors are simply stains that you mix with warm water. They come in powders or concentrated liquids, and you can mix the colors to make the exact color you want. If you do not want to go through all of that, just pick up another can of the same brand of finish that is a lighter shade. Reds, yellows, ambers, and lighter browns all work well for this project. You can always go darker, so keep that in mind when you apply your first costs. If you want something really wild looking, you can always pick out a bright color. I have done this same process with blue, purple, and green stain before. The final product was anything but natural looking, but if you like those colors then by all means use them. For this example, the water color mixture that I typically use on Briar tobacco pipes came out a little too Halloween looking for my taste. So, I made a quick change. Since I used water colors, I just added a little dark walnut to my existing mixture, and went over the piece again to darken the look. This is the advantage to mixing your own stains, and it’s not very hard to learn. Coat your piece with the lighter color on all sides with the exception of the bottom. There was no rustication done to the bottom of the board, so the contrast effect will not work. Apply the stain evenly with a cloth, and you will keep it on the wood colored areas easily. Once you are finished, allow the piece to dry completely. Then, use a compatible lacquer to top coat the diy tea light holder, and allow that to dry as well. I used Deft Satin lacquer on my candle holder. You do not need to dip the piece in lacquer. A light coat to seal in the stain will be perfect. Now that your homemade tea light holder is complete, you can put any type of 1-1/2 inch diameter candle in the openings and use it. I think that tea lights burn out too fast, so I like to give these away with smaller pillar candles instead. It also gives the piece a taller look, which I like too. It is very important that you understand that you are using fire near flammable materials. Wood burns easily, and an unattended candle holder can burn your house to the ground if you are not careful. Make sure that you use any and all safety precautions with homemade candle holder that you would use with anything you purchased from the store. Lastly, if you like this design, please share it with your friends online. I really enjoy making these projects and sharing them with the world. If you would help me reach more people, that would allow me a better opportunity to share what I have to offer with the world. 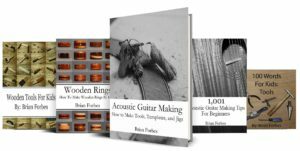 I give away the overwhelming majority of my woodworking and wood finishing tutorials for free, but I also have a couple woodworking books that I sell. 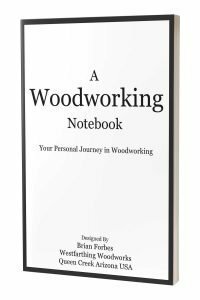 If you like how I explain things, and are interested in the topics covered in the books, they are a great way to enjoy the fun side of woodworking. 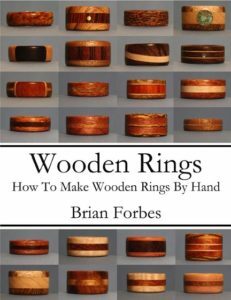 After making several hundred wooden rings, including my own wedding ring, I wrote a book to teach everyone how to make great looking rings. 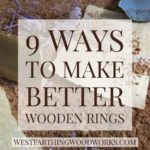 It’s called Wooden Rings: How To Make Wooden Rings By Hand. I also knew that not everyone had a huge tool selection, or a dedicated shop. 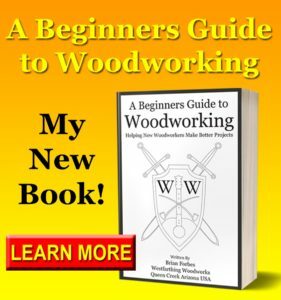 This can make it difficult for a beginner to get something out of a woodworking book. Most people making wooden rings are not full time woodworkers. They have a few tools, but really don’t want to build a small shop just to make a ring for a gift. My solution was to create a book that explained the process using mainly hand tools and inexpensive power tools. 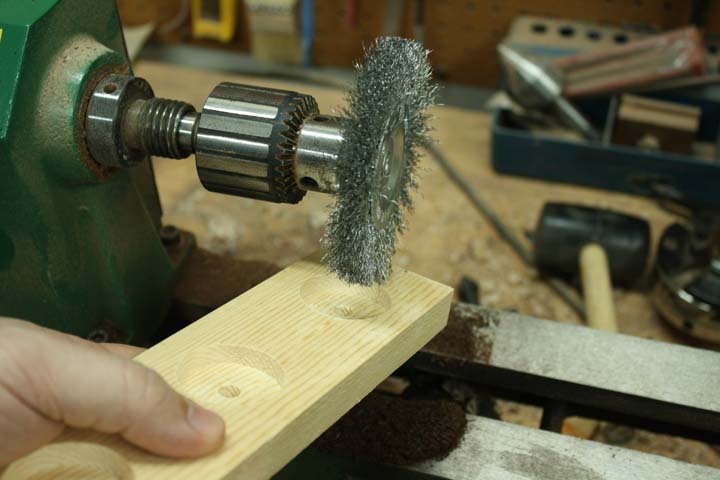 You can get a cheap electric drill from a discount tool store for about $30, and that is really the biggest hurtle to making wooden rings the way that I explain them in the book. Once you have the drill, the rest is just sandpaper, a hand saw, and some smaller materials that might be laying around your house right now. If you have ever wanted to make a ring for yourself or for a gift, this book will teach you everything you need to know to get started. 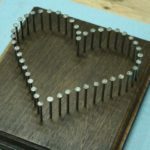 There are step by step instructions, and examples of nearly 50 different rings that you can make. It’s loaded with instructions, and it will teach you everything you need to know about making wooden rings. 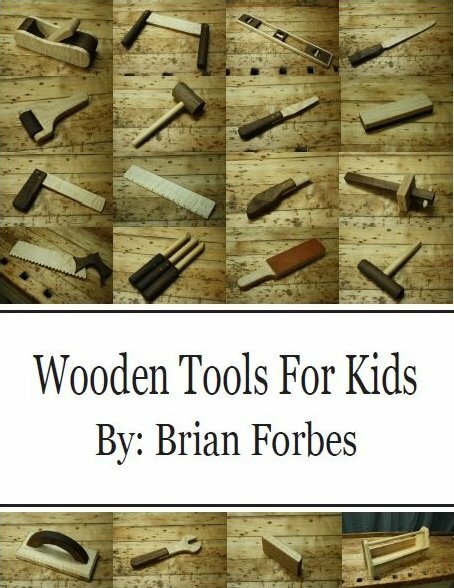 My newest book (as of this article) is called Wooden Tools For Kids, and it teaches you how to make toy wooden tools. My tiny boss (my young son) really loves these tools, and plays with them all the time. 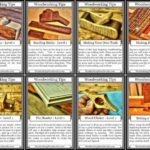 I wanted to make heirloom wooden toy tools for my son, and I wanted it to be a comprehensive set. He has such a great imagination as most young kids do, and I knew that a set of wooden toy tools would make his day. Once I had a lineup that I wanted to create, I set out into the shop and photographed the entire process in an easy to follow step by step manner. After I gave him all of the tools, I wrote and published the book. 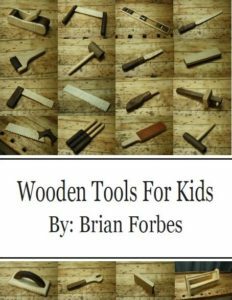 The book has over 20 different wooden tools, and they are all easy to make. 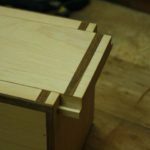 I demonstrate the processes using several different woodworking tools, and you can make easy substitutions for hand tools where needed. In the end I also make a farm style tool box to hold them all, and show an easy way to finish each tool. If you have a young child or grandchild, this is a fun project that will create a set of heirloom toys. I already have lifelong memories from seeing him play with these tools. If you ever want to feel truly appreciated as a woodworker, make something for a child. The explosion of happiness and gratitude that you get in return will make you want to run back into the shop and make even more for them. 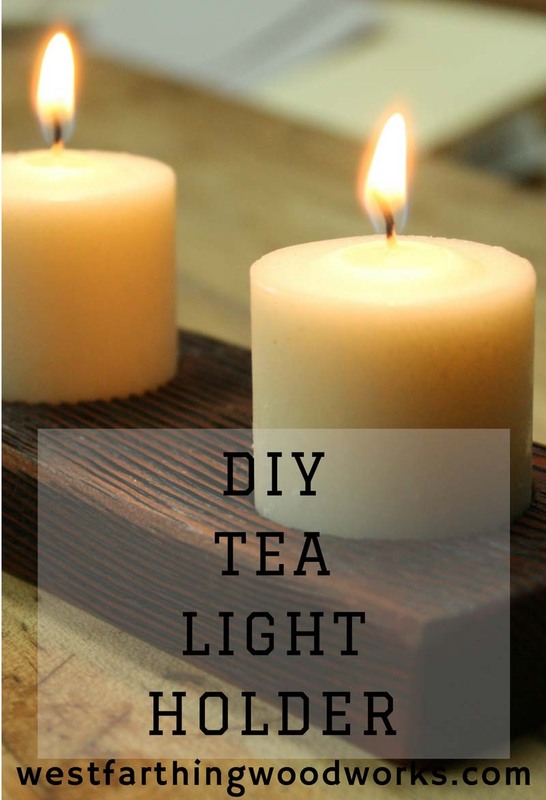 If you have any questions about my DIY Tea Light Holder Project, please leave a comment and I will be glad to answer them. Also, please share my work with your friends on Pinterest! Happy building. I’m on my second attempt of this one, not because the first went badly but it needed improvement. The finish wasn’t great it was just some satin commercial stain I had in the cupboard. Looked pretty tacky but I could see the potential. I’m going to try finishing the second one using tannin/iron dying for black followed either by tannin dye or a matt stain for red-brown. Things I’d change right now for a 3rd attempt – drill a 3-4mm hole through where the spade bits are about to be used. It gives a cleaner hole on the back. I know it’s rarely seen, but still, looks sleeker. Also I’d sand the edges of the holes for the candles prior to hitting them with the wire wheel, to soften the edge of the overall shape but keep the variation in the texture. Thank you Gordon. I’m glad that you are having fun with the project. I have been interested in trying out the tannin/iron dying technique for a while. I have the steel wool and white vinegar in the shop right now, I just haven’t gotten around to starting it. I like your idea about pre-drilling a hole for the center point on the spade bit. They do tend to leave a ragged hole, and your pre-drill with a normal bit would definitely leave a cleaner hole. Thank you again, and happy building. Took me while to get back to you, did it not? 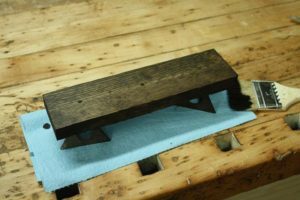 Far easier with some black wood dye but the tannin/iron thing is worth doing just for the experience. Did you get round to it? Aye it was a fun project and I even (cheekily) sold some! One was an 11 candle version, and it was pure murder on the arms brushing that out, even with a drill but it looked pretty damn good when finished. I don’t think there’s a way to inlude a pic but I’ll ping you one through on facebook if you want.